How inclusive is your BYOD policy? When companies say that they are going to implement a Bring your own device (BYOD) policy, allowing employees to use their own personal devices (smartphones, tables and even laptops in some cases); what do they actually mean? What exactly is covered in your BYOD policy, and what is not? For instance, do you say that you support BYOD, but then exclude certain devices; and what do you expect your staff to be doing on their personal devices when they are using them for work purposes? Sometimes it can be seen to be an easy and logical decision to declare an all-out Bring Your Own Device policy. After all, your staff will undoubtedly thank you for allowing them to use their (usually) newer and higher-spec devices and your Finance department will laud your capital expenditure cost-cutting prowess; but if you suspect that your users will want to use their smartphones and tablets for more than checking email and making voice calls (on phones), then there are clearly a raft of additional factors to consider. Let’s take these points one by one. What do you mean by BYOD? If BYOD means for you that an employee can bring any personal device in to the workplace and use it for business purposes, then great. However, that is not the interpretation that many companies actually have. What they really mean is you can bring your iPhone/iPad, and Android device, and possibly a Blackberry device; but probably not devices like Microsoft Surface RT tablets, Windows Phone devices, Google Chromebooks, Amazon Kindle Fire HD tablets, Apple MacBooks, etc.? The truth is that many BYOD regimes are not all-inclusive and companies are compelled to exclude certain devices because enterprise mobile strategies are not always aligned with BYOD policies, meaning that mobile apps and management infrastructures are often not able to cope with BYOD. Why should you not be able to allow any device in the workplace? I hear you say. These devices all use operating systems that support internet browsing and local applications and if you are embracing the concept of Consumerisation of IT, then it would be entirely logical to allow an employee to use their latest Christmas present gadget in the workplace. 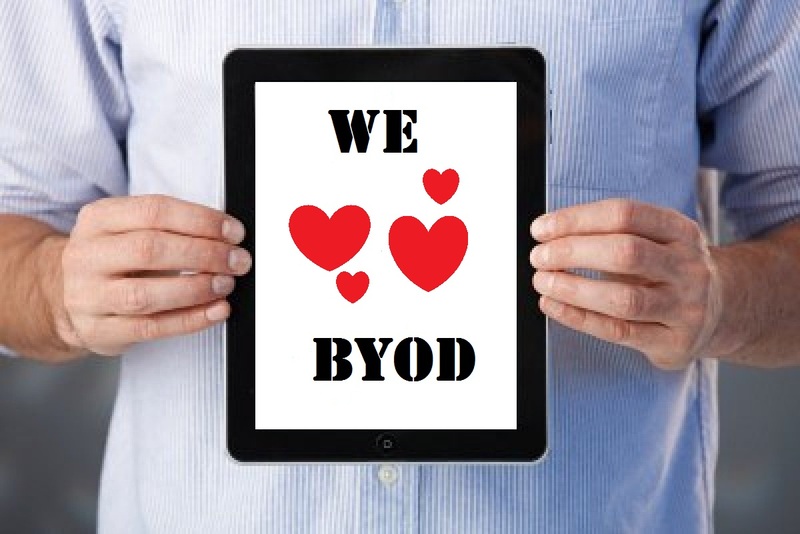 A true BYOD policy should be all inclusive and IT should allow users to bring any connected device in to the workplace and expect to be able to work securely on it for work purposes. For those of you who do want to embrace the principle of BYOD, but who are struggling with being able to execute an effective an non-restrictive policy, perhaps you should look more widely at your company’s goals and strategies for embracing mobile devices and solutions; which brings us on to the next point. What will employees be expected to do with their personal device in a work context? If you expect your staff to do more than use smartphones for voice calls and to pick up corporate email, then you will almost certainly want them to be able to work productively when working on a smartphone or tablet. One of the on-going debates about mobile applications for enterprise users is whether BYOD also goes as far as Bring your own Apps. There will undoubtedly be some apps, like Office productivity tools or web conferencing that make little impact on corporate IT security policies, but if mobile users need to have mobile access to secure enterprise systems, that is another issue. Authentication and security are major issues to get a handle on if mobile users are expected to access corporate systems across the firewall. So too is the state of readiness of corporate applications for mobile use. Enterprise applications like Microsoft SharePoint, for instance, have woefully poor mobile user interfaces as standard. Should you consider a native application or HTML5 mobile app strategy? This is one of those ‘how long is a piece of string’ questions and the answer will depend on the type of mobile enterprise application, who the intended users are likely to be and what devices they are likely to use. The newest generation of mobile web applications can behave just like native apps. They are accessed via home screen application badges/icons and, although they are accessed via the mobile’s browser, they look and behave almost exactly like their native mobile app cousins, but with all of the advantages of being a web based application, like cross-platform compatibility, strong security, and the central purchasing, deployment and updating of licences; without having to necessitate an investment in costly Mobile Device Management (MDM) infrastructures. How does Azurati support all-inclusive BYOD? 2. Azurati Mobile Portal™ Secure mobile container that acts as an application launch-pad for HTML5 apps that require authentication and enterprise-class security. 3. Azurati ASAP® HTML5 mobile enterprise application development platform for developing secure cross-platform mobile web applications. HTML5 or Native mobile apps? That is the question.